The witching hour is upon us! 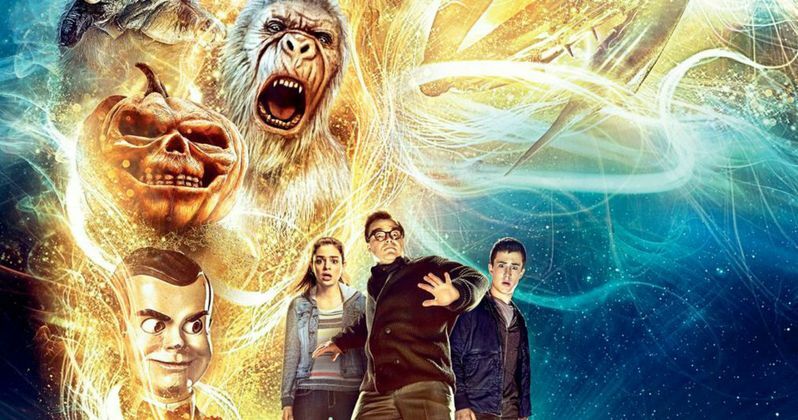 Columbia Pictures has finally unveiled the first trailer for the long-anticipated family horror comedy Goosebumps! And it's everything we could have dreamed of, and more (if our dreams were nightmares)! In theaters just in time for Halloween, Jack Black stars as world famous author R.L. Stine, who must battle the evil creatures that live inside his brain. Upset about moving from a big city to a small town, teenager Zach Cooper (Dylan Minnette) finds a silver lining when he meets the beautiful girl, Hannah (Odeya Rush), living right next door. But every silver lining has a cloud, and Zach's comes when he learns that Hannah has a mysterious dad who is revealed to be R.L. Stine, the author of the bestselling Goosebumps series. It turns out that there is a reason why Stine is so strange...He is a prisoner of his own imagination - the monsters that his books made famous are real, and Stine protects his readers by keeping them locked up in their books. When Zach unintentionally unleashes the monsters from their manuscripts and they begin to terrorize the town, it's suddenly up to Stine, Zach, and Hannah to get all of them back in the books where they belong. Rob Letterman (Monsters Vs. Aliens) directs this horrifyingly funny adventure, based on R.L. Stine's extensive collection of YA horror novels, utilizing some of their most iconic characters. Take a sneak peek, and prepare to be haunted like never before!